You can use Power Manager to automatically mount a hard drive on your Mac. This is particularly useful for preparing a drive for backing up or mirroring your files. When the back up is complete, you can also unmount the same drive with Power Manager. With Power Manager 4.6, we added a few features to help create an event to mount a drive. Let's create an event that mounts a drive each weekday evening. 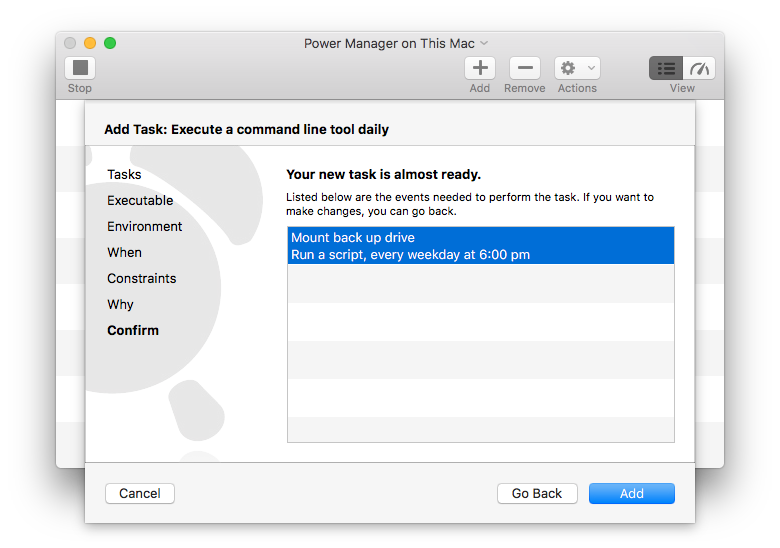 Select Add… or File (menu) > New… > New Event… and then Executable a command line tool daily from the Schedule Assistant. Continue to the Executable step and for the Executable enter the full path to the diskutil tool: /usr/sbin/diskutil. For the second item: Add (pop-up menu) > Volume UUIDs and select your volume to mount; Power Manager will look-up the associated Volume ID for you. 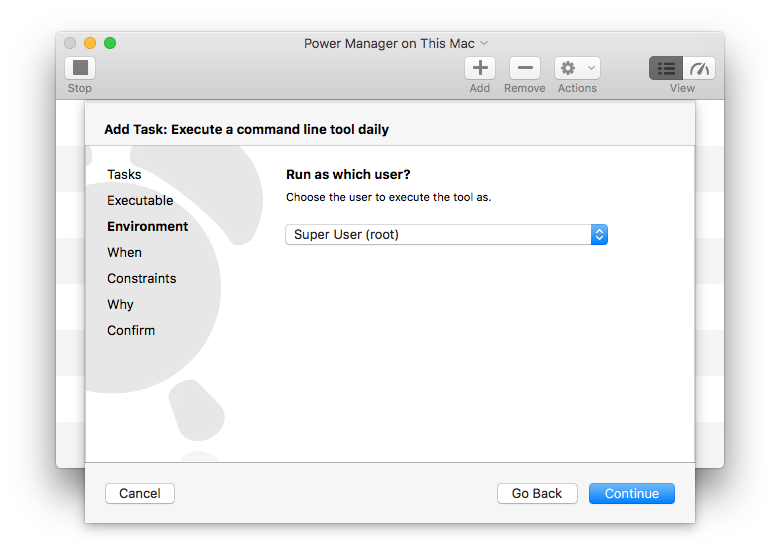 Continue to the Environment step and select Super User (root) for Run as which user?. Performing the command as root ensures the drive is mounted even when no-one is logged into your Mac. Continue to the When step and enter the time and days to perform. Continue to the Constraints step. Here you can provide any additional constraints. In this instance, there is nothing to select or change. Continue to the Why step to name and describe your event. Continue and Add your new automatic drive/volume mounting event. Your new event is complete and ready to use. You should now test your new event. 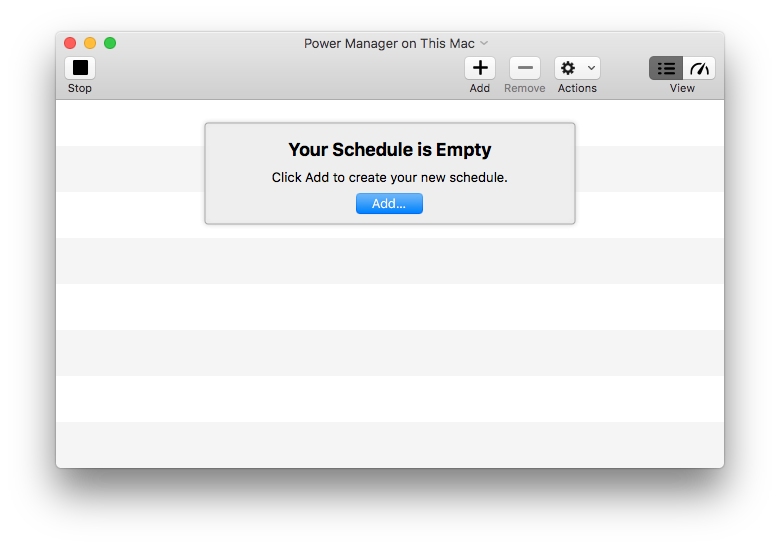 You can do this by unmounting the drive or volume in the Finder, and then triggering your new Power Manager event. 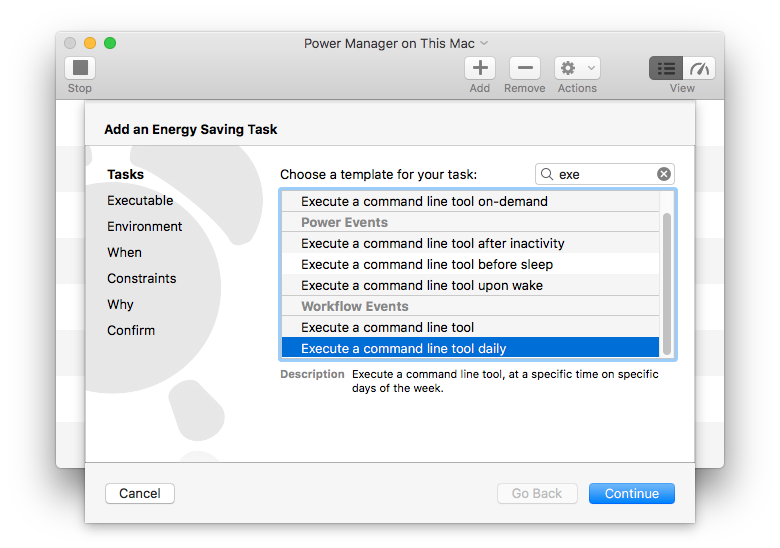 Trigger the event using either the menu item in the top-right of your menu bar, or through the Power Manager.app > Scheduler (menu) > Show Engine interface. 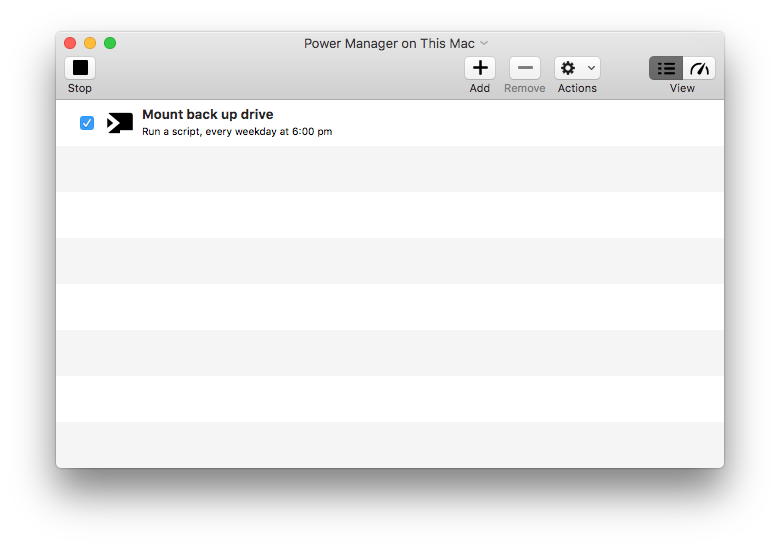 If all goes well, a second or two after triggering the event your drive will mount and be available on your Mac. If the drive is mounted when the event runs, nothing will happen and the drive will remain mounted. 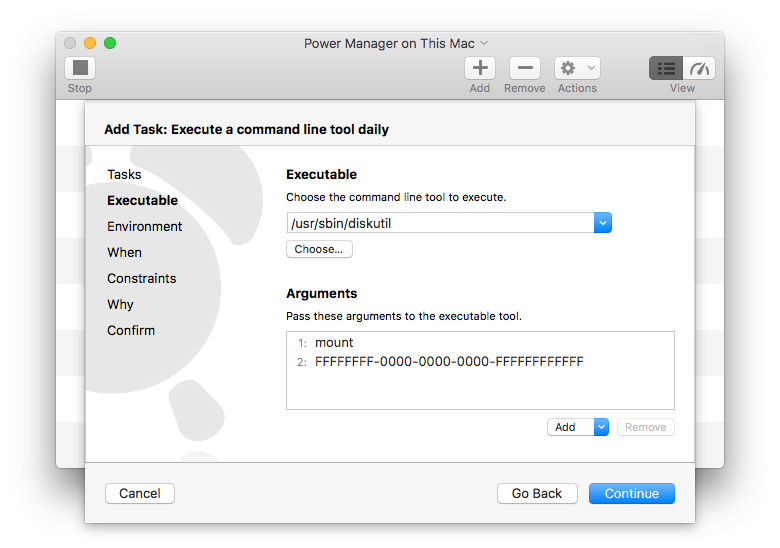 This article was posted in PM4, Power Manager, and Recipe and tagged mount, diskutil, executable command, and volume id.